Before his career as an author, Daniel Defoe was a rather unsuccessful businessman. He habitually accrued large debts, which resulted in his declaring bankruptcy and being arrested. 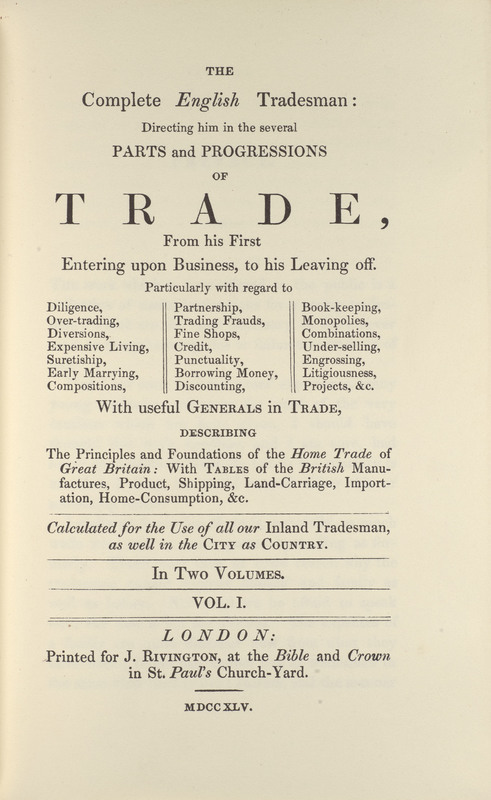 Despite these financial problems, by 1725 Defoe considered himself enough of an expert on trade and economy to write this business textbook. In this far reaching work, Defoe addresses business topics including marketing, finance, accounting, management, and broader economics. Central to this economic framework is the belief that a system of credit built on honesty and trustworthiness was integral to the expansion of trade in Britain. While not as widely read as many of Defoe’s contemporary economic theorists, modern interpretations of this work are largely positive and note how it has remained relevant to current business practices. The Complete English Tradesman. New York: B. Franklin .